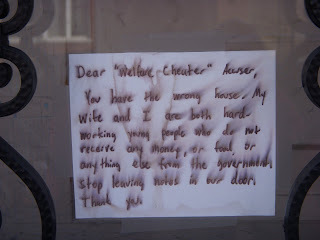 "Dear 'Welfare-Cheater' Acuser, You have the wrong house. My wife and I are both hard-working young people who do not receive any money, or food, or anything else from the government. Stop leaving notes in our door. Thank you." One of the better signs I've found around town. I would have loved to have seen and read the notes that were left at the house for the supposed welfare-cheaters. This sign should be partnered with the "Pooper-Law" sign I found on South 9th Street in my neighborhood. People in South Philly know how to say it like it is!